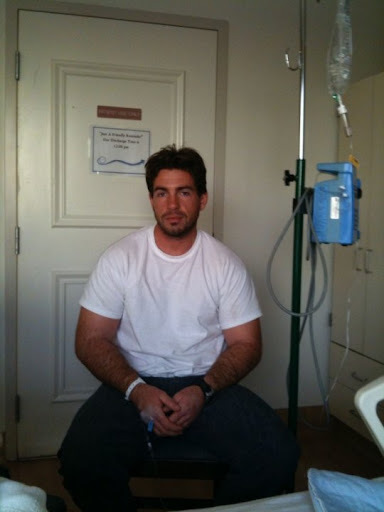 My friend Mike Bargetto is competing in his 2nd Crossfit competition of 2010 tomorrow.. so I thought I'd blog a little something to wish him luck! This first photo was taken the first week of January of this year, after a Crossfit WOD gave him a gnarly case of Rhabdo. Click here if you have no idea what that is. Doctors told him that he'd never be able to feel "the burn" again.. because his body would not be able to handle the exertion. He did what is probably the most difficult thing for a crossfitter to do.. He rested. And after that, he started back up.. slow. Before we knew it.. he was signing up for a crossfit comp. Oohrah. Now this pic I took a month or so ago at the Firefighter Olympics: Crossfit event in Santa Clara. Out of all the guys there that day he deadlifted the 7th heaviest weight. Sorry about the rhabdo. That, unfortunately is typical of Crossfit "programming".